Undercounter Refrigerator, 33-38° F, (2) shelves, stainless steel top & sides, white aluminum interior with stainless steel floor, (1) stainless steel door, (2) front leg levelers & (2) rear recessed castors, front breathing, 1/8 HP, 115v/60/1, 2.5 amps, 7' cord, NEMA 5-15P, cUL, NSF, CE, ENERGY STAR®, MADE IN USA. Undercounter Refrigerator, 33-38° F, (2) shelves, stainless steel top & sides, white aluminum interior with stainless steel floor, (1) stainless steel door, 5" castors, front breathing, 1/6 HP, 115v/60/1, 3.9 amps, 7' cord, NEMA 5-15P, cUL, UL-Energy, NSF, CE, ENERGY STAR®, MADE IN USA. Undercounter Refrigerator, 33-38° F, stainless steel top & sides, white aluminum interior with stainless steel floor, (2) drawers each accommodates (1) 12x20x6 food storage box (NOT included), 5" castors, front breathing, 1/6 HP, 115v/60/1, 3.9 amps, 7' cord, NEMA 5-15P, cUL, NSF, CE, MADE IN USA. 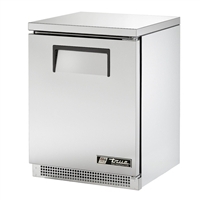 Undercounter Freezer, -10° F, (2) shelves, stainless steel top & sides, white aluminum interior with stainless steel floor, (1) stainless steel door, 5" castors, front breathing, 1/3 HP, 115v/60/1, 4.8 amps, 7' cord, NEMA 5-15P, MADE IN USA. Undercounter Freezer, -10° F, stainless steel top & sides, white aluminum interior with stainless steel floor, (2) drawers each, accom. 12"x20"x6" pan (NOT included), 5" castors, front breathing, 1/3 HP, 115v/60/1, 7.4 amps, 7' cord, NEMA 5-15P, MADE IN USA. Undercounter Refrigerator, 33-38° F, (2) shelves, stainless steel top & sides, white aluminum interior with stainless steel floor, (1) Low-E glass door, 5" castors, front breathing, 1/6 HP, 115v/60/1, 3.9 amps, 7' cord, NEMA 5-15P, cUL, NSF, CE, MADE IN USA. Undercounter Refrigerator, 33-38° F, (4) shelves, stainless steel top & sides, white aluminum interior with stainless steel floor, (2) stainless steel doors, 5" castors, front breathing, 1/6 HP, 115v/60/1, 4.7 amps, 7' cord, NEMA 5-15P, cUL, UL-Energy, NSF, CE, ENERGY STAR®, MADE IN USA. Undercounter Refrigerator, 33-38° F, (4) shelves, stainless steel top & sides, white aluminum interior with stainless steel floor, (2) stainless steel doors, 5" castors, front breathing, 1/5 HP, 115v/60/1, 5.0 amps, 7' cord, NEMA 5-15P, cUL, NSF, CE, ENERGY STAR®, MADE IN USA. Undercounter Refrigerator, 33-38°F, stainless steel top & sides, white aluminum interior with stainless steel floor, (1) door with 2 shelves, (2) drawers each accommodates (1) 12x18x6 food storage box (NOT included), 5" castors, front breathing, 1/5 HP, 115v/60/1, 5.0 amps, 7' cord, NEMA 5-15P, cUL, NSF, CE, MADE IN USA. Undercounter Refrigerator, 33-38° F, stainless steel top & sides, white aluminum interior with stainless steel floor, (4) drawers each accommodates (1) 12x18x6 food storage box (NOT included), 5" castors, front breathing, 1/5 HP, 115v/60/1, 5.0 amps, 7' cord, NEMA 5-15P, cUL, NSF, CE, MADE IN USA.